Today is Jewish new year. This is a unique holiday for many reasons. First, it’s the only holiday that lasts two days. It’s weird, isn’t it? How can a new year start with two consecutive days? Secondly, there are actually two new year holidays according to the bible. 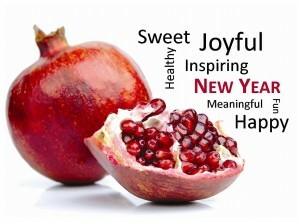 There is this holiday called Rosh haShana, and there is Passover, which is celebrated in spring. That’s because Judaism is an agriculture religion. All the major Jewish holidays are about harvest times and Rosh Hashana is just a reference point in order to calculate harvest times. It’s kind of redundant in these modern ages, right? Thirdly, there isn’t a formal celebratory tradition for Rosh Hashana like the Passover dinner. I mean, there is a dinner, of course, every Jewish holiday has a dinner, even Yom Kippur fast begins with a special dinner. Rosh Hashana has 2 big dinners and 2 big lunches because it is a 2-days holiday. At the end, everyone is so stuffed, we’re actually yearning for a Yom Kippur fast. But what do you eat on Rosh Hashana dinners? Huh, that’s a debate that’s been going on for years, because each ethnic group developed its own Rosh Hashana traditions, which is great, in my opinion, because it presents an opportunity to learn new recipes and be exposed to new tastes. So, Rosh Hashana dinner is kind of an evolving tradition. It changes all the time and brings new surprises every year. How fun is that? But my favorite Rosh Hashana thing is the atmosphere. It’s something that you feel only in Israel. It starts about a month before when people are finalizing their holiday plans. You can sense the expectations in the air. It’s a sense of calmness mixed with hurry and nervousness. People greet each other with “Shana Tova”, meaning have a good year. And you say it to anyone and everyone. I just love it. I mean, Israelis are still rude and direct, they can yell at you because you lingered for a second after the traffic light turned to green, they will curse and call you names but they will finish their shaming speech wishing you Shana Tova. It’s just hilarious. You’ve got to love it. Shana Tova everybody, Shana Tova!